Many banknotes from lots of countries have been overprinted for various reasons over the years. Some are more attractive than others, and some of them relate quite an interesting story. 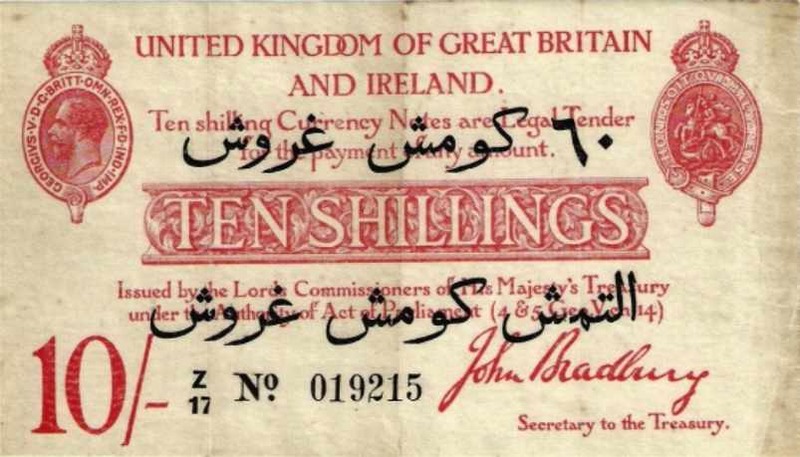 World War 1 Dardanelles Campaign Overprint on an English Treasury note. Here is an interesting example of an Ulster Bank £1 note printed in 1927 which was overprinted to make it usable in Northern Ireland after 6th May 1929. A few different dates are known with this type of overprint. 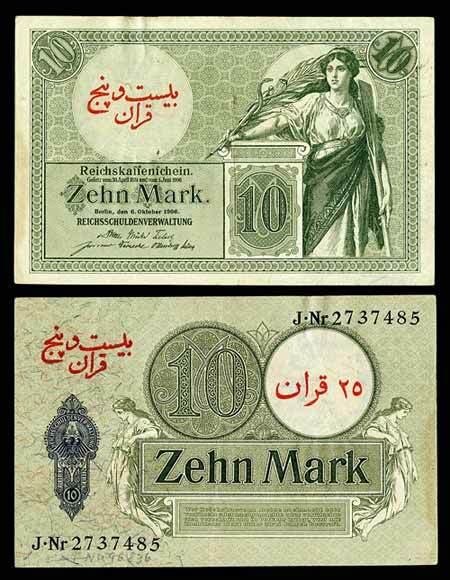 Foreign Intervention in Iran during WW1 lead to this German overprint for Persia. 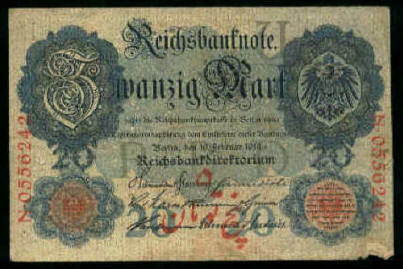 During the First World War, the German Military overprinted Reich banknotes and distributed them through their agents in Hamadan and Kermanshah in Persia as part of a campaign to gain influence in the region. 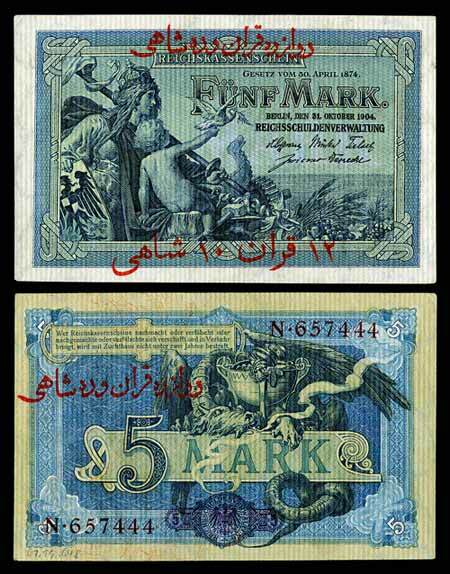 More about these issues at the Iranbanknotes web site, where the banknote picture below can be found. There are lots of fake overprinted notes being made currently, especially when the non-overprinted note is very common, so always beware when collecting them. EDIT: Two more examples. These two notes are in the National Museum of American History. Provisional issue for French Somaliland, ca1943. The overprinted is in black—two crosses of Lorraine, Djibouti, and the head of an antelope with a signature on either side of it—on a French Indochina note. World War 2. 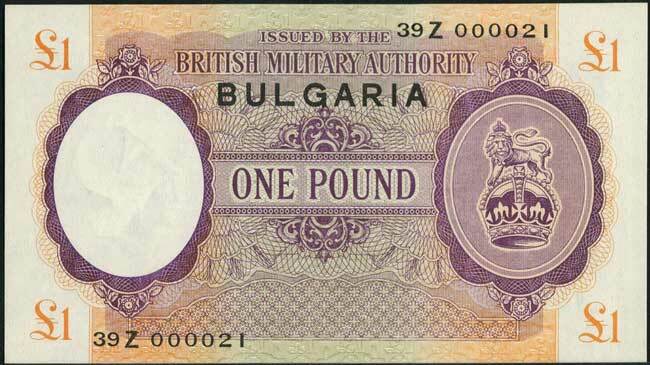 British Military Authority, £1 note with Bulgaria overprint. World War 2. British Military Authority, £1 note with Greece overprint. These notes are apparently as rare as hen's teeth, with just 25 examples printed of each overprint. A nice variation on an attractive series. New Zealand 1Pound note overprinted for use in Fiji. The East Caribbean currency union was a mini version of the Euro—it is still going strong. 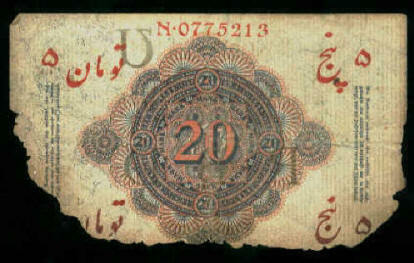 At one stage each bankote had an overprint identifying which island the note was drawn on. The overprint letters are drawn from the islands' names in a similar fashion to the way in which the Bank Key Letters on Ploughman notes were chosen. Go to more about the Eastern Caribbean Dollar, and more pictures of EC Dollars. These ones remind me of the Irish warcode notes! Circled letters are a nice collectible feature on a bank note. 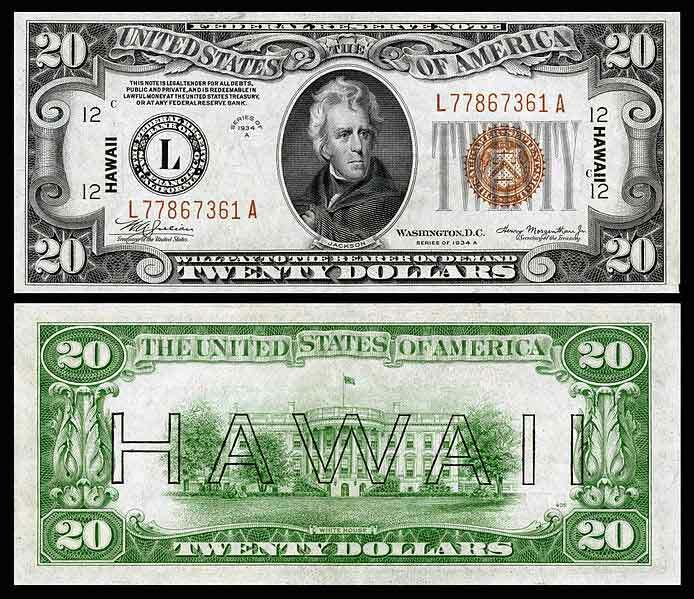 The HAWAII overprint was made on the standard design of US notes which were issued in Hawaii after the Japanese attack on Peral Harbour in 1941. Another Irish note, an overprint on an unissued Northern Bank all-Ireland issue note to create a new issue for use in Northern ireland after partition. 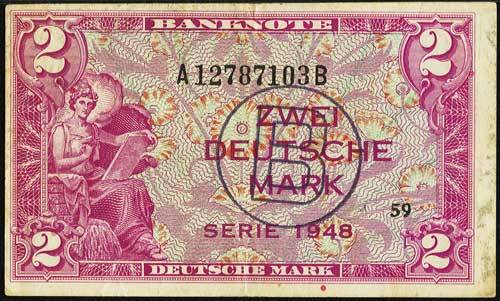 Germany, an overprint B on the 1948 series for issue in Berlin at the time.